In my mid-twenties, I’ve simultaneously progressed from finger paints to color swatches for the living room walls and graduated from Bonne Bell Lip Smackers to a whole new world of makeup at Sephora, but what I didn’t know was that I could combine my two new trades into one – Sephora’s Color IQ. 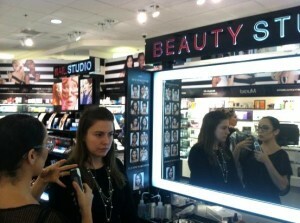 Sephora Cast Member, Jessica Reyes, educated us on Sephora’s Color IQ technology. The San Francisco, CA-based company partnered with PANTONE Inc., the company that is best known for its Pantone Matching System used typically in the printing industry and sometimes for colored paint, fabric, and plastics, to create PANTONE’s very own SkinToneTM Shades of makeup for Sephora. 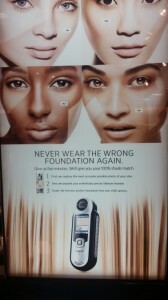 In the beginning, Sephora’s exclusive Color IQ technology was a service that was used to match foundation shades only. With a few teaks here and there, the Sephora + PANTONE Color IQ will now match for foundation, concealer, and lip color. Essentially, this handheld device takes three pictures of the surface of your skin accounting for red and yellow undertones, assigns the average color shade to a Color IQ number, and then provides you with recommended matches solely based on your unique number. During our visit at the nearest Sephora location, we were walked through the Color IQ process, educated on red and yellow undertones, and assigned our very own Color IQ numbers. Additionally, we were told that in order to get the most accurate match, the skin must be makeup free and while taking the three pictures, the Sephora Cast Member must avoid any freckles or beauty marks so that it does not throw off the average skin color result. Once finished, we were able to see products like full coverage foundations to BB Creams and CC creams, concealers, and lip stains to lip glosses available in-store and online. Furthermore, Sephora introduced the world to two other technologies: Skincare iQ and Fragrance IQ. Both touchscreen technologies allow customers to take quizzes and search by brand, preference, or skin type. Based on the answers, each technology will filter through Sephora’s in-store and online products to tailor a fragrance or skincare product to your every need. Once you’ve found the skincare product that best fits your skin preferences, you can print out information on the product and speak with one of Sephora’s skincare specialists. Additionally, as the holiday season comes full force, look to Sephora’s Fragrance IQ for help finding the perfect gift of fragrance for all of your friends and family. According to Chain Store Guide’s Drug Store and HBC Chains database, there are approximately 360 Sephora locations across 38 states including D.C. and in over 14 countries.